The Porsche community unites once again for the ultimate summer festival at Brands Hatch. After a four year hiatus the Festival of Porsche returned to Brands Hatch at the weekend, coinciding with Porsche’s ongoing 70th anniversary celebrations. The small and historic British racing circuit promised to be the perfect venue for this hotly anticipated single marque event, offering intimate access to static displays, demonstration drives and full-blown races during a jam-packed Sunday schedule. Under cloudless skies cars filled the surrounding fields and paddocks, ranging from elegant 356 Cabriolets and short wheelbase 911s to the latest GT2 RS – poetic bookends of Porsche’s 70-year long road-going programme. 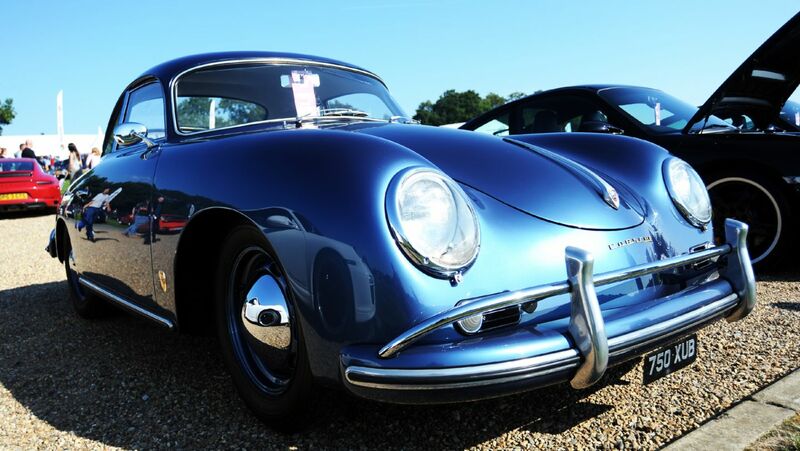 Organised by the Porsche Club of Great Britain in conjunction with MotorSport Vision, the event would attract not only thousands of Porsche fanatics from all over Europe, but the pit lane was awash with eye-popping icons of every age and type. A slow stroll along this short stretch of tarmac provided an unprecedented journey through the history of Porsche Motorsport. First up was an immaculately restored pre-A 356 in full race trim, neighbour to the ultra-rare and similarly perfect 718 RS60, the car that brought Porsche a famous win at the 1960 12 Hours of Sebring with Hans Hermmann at the helm. Next in line was a 910, the svelte successor to the 906, its minute proportions and modest curves a reminder of just how far sports prototypes have come since the mid-Sixties. Alongside this was the beautiful 904 Carrera GTS, running its original Fuhrmann four-cam engine and sporting the striking orange paintwork of Team Holland, the outfit that launched Gijs van Lennep’s career with Porsche. A pair of the 904’s contemporary 911s were next, their compact monocoques and sober liveries duly dwarfed by the extravagant 935s that came a decade later, supersized wings and candy colours the hallmarks of a new era in motorsport. Beyond them, an original 911 SC RS, built by Prodrive for Porsche’s customer rally campaigns, sharing the off-road limelight with the Jacky Ickx 959 that competed on, and eventually won, the infamous Paris-Dakar. Everywhere you turned there was a car of impossible rarity and importance, from the Brumos-liveried RSR to one of the three 924 GTPs that raced at Le Mans in 1980. The Bell/Bellof 956 so famous for its Group C dominance and that stunning lap time around the Nordschleife vied for glory with the Museum’s own 911 GT1, the very car that took outright victory at Le Sarthe in 1998. Next door, in the shade of a secure pit garage, the legendary Salzburg 917K that gave Porsche its first overall win at Le Mans drew a steady stream of onlookers. Surrounded by a bustling crowd of all ages and examples from the Porsche Museum collection, was the 919 Evo, busily being prepped for its first outing of the day, a dizzying medley of monitors and lap tops alongside air-jacks, tyres and tireless technicians. The passion for Porsche in all its forms was everywhere to see at Brands, from the fastidiously maintained road cars that had brought so many here to the exemplary vintage racers that were still on the button and being driven as intended all these years later. Another slice of the Porsche life came in the form of the Club Championship, two rounds of which took place around the short and challenging Indy circuit, with the series leaders battling it out in their privateer 911s in a nail-biting denouement to another fiercely contested season of grassroots motorsport at its very best. Also driving cars throughout the day were British heroes of Porsche’s racing past such as Derek Bell and Richard Attwood, while looking on was fellow countryman Magnus Walker, championing a different avenue of the diverse yet united Porsche community. All eyes were on another Briton, too, as Le Mans winner and IMSA ace Nick Tandy prepared to drive the 919 Evo for the first time. This ultimate evolution of Porsche’s dominant hybrid race programme would see well over 1000hp unleashed on the narrow corners and short straights once raced in anger by the likes of Pedro Rodriguez and Jo Siffert in the 917K. A mix of emotions saw Tandy at once excited to be driving the Evo and sorry that this would probably be his last outing in the 919. Determined it would go out in style, he unleashed as much of the Evo’s incredible potential as the confines of Brands Hatch and the limitations of demonstration tyres would allow, passing 308km/h (190mph) before the Paddock Hill bend – a record speed for the short circuit. As the late summer sun began to set over Southeast England, the track finally fell silent and the distant car parks rang out with the unmistakable sound of flat-sixes firing into life. Another remarkable entry in an unforgettable year for Porsche, over all too soon, but sure to live long in the memory. Gemeinsame Leidenschaft: Im Newsroom berichtet Social Media-Star Daniel Fuchs von seinen Eindrücken. In der 2. Folge der „Porsche Top 5“ Serie unternimmt Derek Bell eine Zeitreise durch die Sportwagen-Geschichte. Inside the tropical treasure trove of Southeast Asia’s buzzing Porsche community at “Das Treffen”.